Say goodbye to the waste, rubbish and clutter in your life without any of the hard work – with just one phone call to Go Rubbish Go you can enjoy top-quality rubbish removal and disposal services to suit you! We offer a range of professional Bethnal Green waste collection services to meet your every need, whether you have rubbish in your garage or waste in your garden. We have years of experience, friendly specialists and low prices, making us the perfect choice if you want a clearer property. 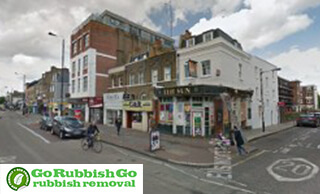 Find out more about the many ways we can help you – act now and book today our rubbish removal Bethnal Green by calling 020 8610 9182! Our company is proud to offer the best in rubbish disposal E2 services, but that doesn’t mean you’ll be paying high prices! We work hard to bring amazing value for money to all of our clients, and if you want rubbish removal help that won’t break the bank then you don’t need to look any further! With exclusive special offers and deals to help your money go further, and lots of reasons to hire us – including our fantastic money-back guarantee! – you’ll love what we can do for you. Get a free quote now with no obligation necessary – pick up the phone and call 020 8610 9182 today! 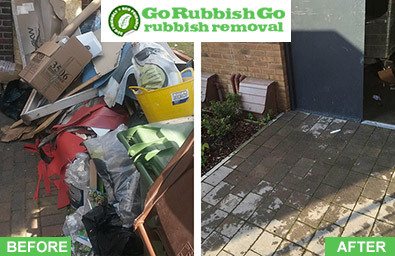 Go Rubbish Go works to bring you efficient and fast rubbish removal services with amazing attention to detail, saving you hours of hard work and guaranteeing the results that you want to see. Simply pick up the phone to arrange a time for your waste disposal in E2, Bethnal Green and we’ll come to your property to collect all waste and dispose of it properly. You won’t need to worry about disposal, or hire a van or skip as we’ll handle all of the hard work for you! From after-builders waste to clearing up before you move house, there are lots of ways we can help you if you need a rubbish disposal expert. Call and book today on 020 8610 9182! This company were very professional and helpful and I would definitely recommend them for waste collection in Bethnal Green, E2. I called the company and spoke to a very lovely person who paid special attention to my needs and wishes. I booked their service for a weekend and even though it was an out-of-hours service it was very affordable. The staff did a great job at collecting every bit of waste and they disposed of it as well. Good value and good service – thanks! Our experts are wholly committed to providing only the best for our clients, which is why we offer our fantastic services at a range of times to match your schedule! You can hire our rubbish removal teams on evenings, weekends and on Bank Holidays so that you won’t need to interrupt your busy workload, and we even have same-day E2 waste clearance service available as well! All of our services are fast and reliable, with results that won’t disappoint no matter what you might be looking for. Contact our teams now for professional rubbish clearance help for your home or office! We all need to be more aware of our carbon footprints, and if you care about the planet then our Bethnal Green rubbish clearance company is the right choice for you. 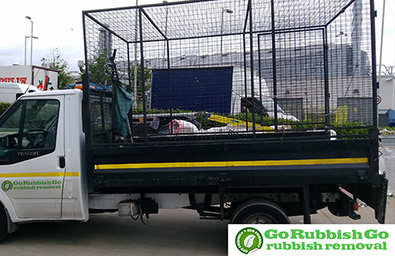 We’re wholly committed to providing eco-friendly waste removal Bethnal Green, E2, by using greener vehicles and the proper disposal methods. We recycle wherever possible to ensure that all of our customers are getting a high-quality and greener service to benefit both yourself and the environment. If you’re keen to find out more about our environmentally-friendly disposal and collection methods, or if you want to book your appointment, simply pick up the phone and dial 020 8610 9182 to speak to a specialist now! Bethnal Green is part of the London Borough of Tower Hamlets and bears the E2 postcode. The area has a rich history dating back to the 1700s, and is located just three miles from Charing Cross. Bethnal Green is well-known for its excellent schools for children of all ages, making it a popular place for families. There are a number of sights of interest in the area, including the Victoria and Albert Museum of Childhood. Bethnal Green is perhaps most famous for the Bethnal Park, which provides leisure activities for the whole family. The nearest stations are Bethnal Green and Cambridge Heath railway stations, though the region is also well-served by bus.